Nitish Rana, Andre Russel play a blinder against Hyderabad to help Kolkata win by six wickets. 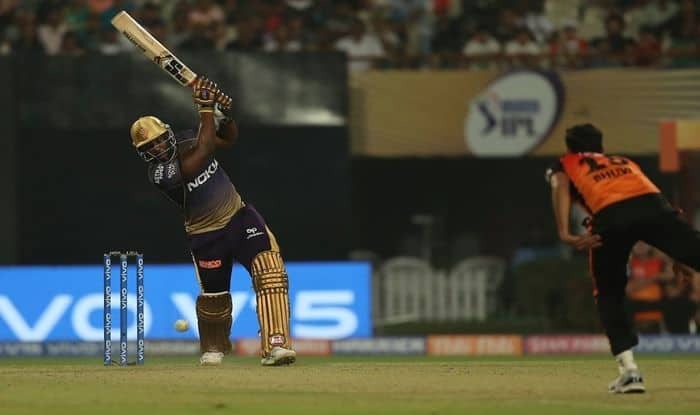 IPL 2019: Andre Russell (49*), Nitish Rana (68) played spoilsport as Kolkata beat Hyderabad by six wickets in a last-over thriller. All eyes were etched on David Warner’s comeback and he did not disappoint as he smashed a blistering 53-ball 85. Hosting Hyderabad at Eden Gardens, Knight Riders won the toss and opted to field first a decision they may regret now. SRH got off to a flyer as Warner-Bairstow stitched a 112-run-stand before Chawla dismissed the Englishman. At No 3 came Vijay Shankar with a lot to prove and he too made amends as he scored a quickfire 24-ball 40 to propel Hyderabad to 181/3 in 20 overs. For KKR, Russel with a couple of wickets was the best bowler. Chasing 182 to win, KKR got off to a poor start as they lost dangerous Chris Lynn (7) early in the piece. That is when the experienced Robin Uthappa came in the middle and joined the talented Nitish Rana to get the Knights chase back on track with a partnership of 80 runs for the second wicket. Both the players showed a lot of maturity in each others company as the shot selection was top-notch before Uthappa was dismissed for a promising 35 off 27 balls. Soon after Uthappa departed, KKR lost Karthik (2) in quick succession. All that was happening around Nitish Rana did not bother the southpaw as he scored 68 off 47 balls. It finally came down to 13 off the last over and it was Shubman Gill whose two sixes sealed the game for Kolkata.